After some initial setup, CloudFront works together with your website or application and speeds up delivery of your content. This section explains how CloudFront serves your content when viewers request it. A user accesses your website or application and requests one or more objects, such as an image file and an HTML file. DNS routes the request to the CloudFront edge location that can best serve the request—typically the nearest CloudFront edge location in terms of latency—and routes the request to that edge location. CloudFront compares the request with the specifications in your distribution and forwards the request for the files to the applicable origin server for the corresponding file type—for example, to your Amazon S3 bucket for image files and to your HTTP server for the HTML files. The origin servers send the files back to the CloudFront edge location. As soon as the first byte arrives from the origin, CloudFront begins to forward the files to the user. CloudFront also adds the files to the cache in the edge location for the next time someone requests those files. CloudFront edge locations make sure that popular content can be served quickly to your viewers. CloudFront also has regional edge caches that bring more of your content closer to your viewers, even when the content is not popular enough to stay at a CloudFront edge location, to help improve performance for that content. Regional edge caches help with all types of content, particularly content that tends to become less popular over time. Examples include user-generated content, such as video, photos, or artwork; e-commerce assets such as product photos and videos; and news and event-related content that might suddenly find new popularity. Regional edge caches are CloudFront locations that are deployed globally, close to your viewers. They're located between your origin server and the global edge locations that serve content directly to viewers. As objects become less popular, individual edge locations may remove those objects to make room for more popular content. Regional edge caches have a larger cache than an individual edge location, so objects remain in the cache longer at the nearest regional edge cache location. This helps keep more of your content closer to your viewers, reducing the need for CloudFront to go back to your origin server, and improving overall performance for viewers. When a viewer makes a request on your website or through your application, DNS routes the request to the CloudFront edge location that can best serve the user’s request. This location is typically the nearest CloudFront edge location in terms of latency. In the edge location, CloudFront checks its cache for the requested files. If the files are in the cache, CloudFront returns them to the user. If the files are not in the cache, the edge servers go to the nearest regional edge cache to fetch the object. In the regional edge cache location, CloudFront again checks its cache for the requested files. If the files are in the cache, CloudFront forwards the files to the requested edge location. 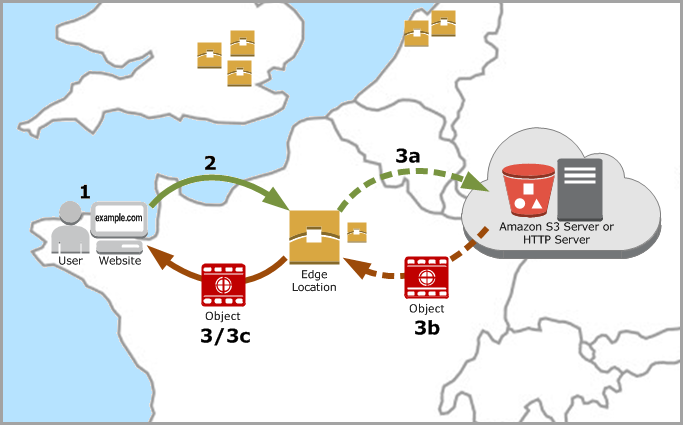 As soon as the first byte arrives from regional edge cache location, CloudFront begins to forward the files to the user. CloudFront also adds the files to the cache in the requested edge location for the next time someone requests those files. For files not cached at both the edge location and the regional edge cache location, CloudFront compares the request with the specifications in your distributions and forwards the request for your files to the origin server. After your origin server sends the files back to the regional edge cache location, they are forwarded to the requested edge location, and CloudFront forwards the files to the user. In this case, CloudFront also adds the files to the cache in the regional edge cache location in addition to the edge location for the next time a viewer requests those files. This makes sure that all of the edge locations in a region share a local cache, eliminating multiple requests to origin servers. CloudFront also keeps persistent connections with origin servers so files are fetched from the origins as quickly as possible. Regional edge caches have feature parity with edge locations. For example, a cache invalidation request removes an object from both edge caches and regional edge caches before it expires. The next time a viewer requests the object, CloudFront returns to the origin to fetch the latest version of the object. Proxy methods PUT/POST/PATCH/OPTIONS/DELETE go directly to the origin from the edge locations and do not proxy through the Regional Edge Caches. Dynamic content, as determined at request time (cache-behavior configured to forward all headers), does not flow through regional edge caches, but goes directly to the origin.